A small crisp batter cake, baked in a waffle iron and eaten hot with butter or syrup. But if we investigate its etymological origins we discover much more. From Proto-Germanic *weƀaną we obtain the verb weave (900), which has two meanings; (1) "to weave, form by interlacing yarn" (2) "to move from one place to another". From this latter term the name weevil, a small beetle, was probably derived. Weave was also the source for the Old English noun webb which meant "woven fabric, woven work, tapestry", whose meaning was later transformed to web, as in a spider's web (13th C) and cobweb (14th C). From the the related Middle Low German wāfel the term was loaned to Middle English (1377) and became wafer. The actual woven-like waffles that we eat today arrived in the US with the first Dutch settlers in 1620 on the Mayflower and were originally called Dutch wafers. By 1735 the Dutch wafel gained an extra "f", becoming waffle. The onomatopoeic waff (17th C) which means to bark or to yelp like a dog is, sad to say, virtually obsolete but its modern-day counterpart, woof (19th C), still thrives. From An Etymological Dictionary of the Scottish Language (1808) by John Jamieson we gleam that since at least 1678, waff and waif meant "the act of waving" and "to fluctuate" whereas waff alone, denoted someone who was worthless. But there is no mention of it meaning to yelp or bark incessantly. Once again there's no mention of it meaning yelp. 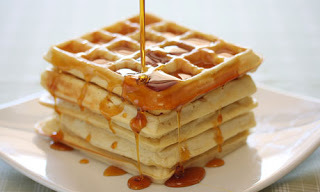 Today in Europe, waffles are popular snacks in Belgium; Portugal; France; The Netherlands; Germany, and Sweden, whose inhabitants celebrate Annunciation Day on March 25th by eating waffles. However, in the UK they are rarely eaten for breakfast, or at any time. British people know what waffles are but they are considered primarily, an American treat. Have I got the facts straight? I have crossed-reference and triple-checked where possible but nevertheless I may have committed some errors. When was the American to waffle (the intransitive verb, meaning to be unable to make a decision; waver) first used and where? I've read it is connected to the Scottish waff, but I did not find any references to its first use in speech or print. Is there an explanation for the divergence in meaning between the BrEng sense i.e. Lengthy but vague or trivial talk or writing (OED) and its American counterpart? The verb is largely derogatory, which I find particularly curious. And finally, has this divergence narrowed? Are American speakers familiar with the UK sense and vice-versa? To clarify, because I realize the wording may have been misinterpreted. Can anyone find an American citation, quote, quotation, excerpt etc. with the term waffle meaning to vacillate dated before 1962? Not one answer has so far attempted to explain the divergence between the US and the UK meaning of waffle. I know it's not easy, but that's why I've put up 350 points. Previously, I posted an Ngram chart illustrating my surprise that waffle used in its verb form seemed to not exist before the late 1950s. When using Ngrams I started with a much wider timescale: 1800 to 2008, I hadn't noticed the tiny bump that appeared sometime in the 1920s. My error, my fault and for that I apologize. Here is the same Ngram updated. When I dug a little deeper, I found a quote dated 1913 using waffle in its gerund form. Here is a new Ngram chart with "waffling" included in the search. As you can see, it tells a very different story. Notice how waffling dominates the map, making he waffled insignificant and irrelevant. As a result, I still maintain that the question is not one of general reference. The scope for discussion is much wider than simply looking up waffle in Wikipedia. If someone keeps changing their mind, they are by definition being vague and talking about nothing in particular. There could be other reasons to (hiding something... not knowing what they are talking about, etc) but that doesn't alter the fact that BrEng and AmEng agree that indecisive people waffle. I believe the difference is more marked than the one suggested by the user. And I'll do my best to explain why. I'll include my personal definition of the BrEng sense of the word waffle which I left in a comment to the aforementioned British speaker who argues that there is no discernable difference. One of the earliest instances I found with the verb used in the BrEng sense is in a book entitled The Writings of Ian Hay: Happy-go-lucky by Ian Hay, dated 1913. Wishy-washyness, often spelled wishi-washiness, is not synonymous with flip-floppiness. I dealt with flip-flop, both noun and verb, a few months ago, defining the side-switching not so much as a permanent change of mind but with its verb synonym "waffle" (from the Scottish waff, "gust of wind"; nothing to do with the Dutch wafel, "cake baked on a grid"). Think of how much time you waste waffling between a yes and a no, deciding whom to hire, where to locate your business and how to organize your day. Now there is software that can make your choices easier. A British speaking person may have said “humming hawing” (US hem haw), “wavering” or “dithering” in its place. “Sitting on the fence” is another alternative. His hero is a 30 year old Catholic bachelor waffling between the priesthood and love of a lass, who is, alas, both a protestant and a librarian. This is a readable novel with many droll characters. The earliest reference I found in Google books with waffled as it is used today is dated 1962 from The U.S. Government Printing Office. 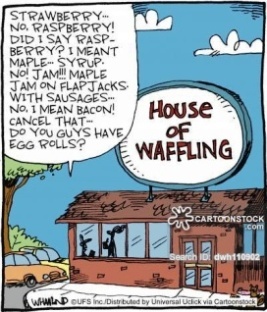 It's interesting to note that the term waffled is described as local jargon and in the earlier clipping it is quoted, implying that the term was relatively new and considered almost dialectal. The findings so far seem to suggest that the verb waffle as used in the UK and in the US is much more recent than any of the references or dictionaries I consulted have suggested. There is no evidence that proves that the AmEng verb existed (at least in print) before the 1950s. Whereas in the UK the earliest instance of waffled, meaning to speak at great length without meaning, is dated 1913. The suggested US meaning is found in the glossary of "Westmoreland and Cumberland Dialects" by "Various Writers in the Westmoreland and Cumberland Dialects", published in 1839. Was nobbet a waffler for Matthew Macree. Was nothing but a waverer for Matthew Macree. In this sense, "waverer" appears to mean someone who is physically unsteady, or swaying, from which it is not to great a leap to the more modern meaning of being indecisive, in the same way that "vacillate" is more commonly used to mean being indecisive, than its original meaning of swaying or being unsteady. WAFFLE, To wave, to fluctuate. Identical with WABBLE. Sax. Wafian, vacillare. Teut. Weyfelen, fluctuare. Swed, wefta, vibrare. This links nicely to the Anglo-Saxon dictionary reference below. I'm in the process of checking some references but I'm fairly confident that "waffling" meaning prattling or talking endlessly without substance may come "whiffling". In "History of the Proceedings and Debates of the House of Commons" from 1796 is found "whiffle-whaffling fluff". I want to do some more research to make sure I've not misunderstood the context, but it does seem to be relevant at first inspection. My new favourite reference, Joseph Bosworth's Dictionary of the Anglo-Saxon Language could be of use with reference to all the three meanings of waffle you refer to. WAFOL / WAFUL: Hesitating through astonishment. Again the Latin is more revealing - "vaicllans" (vacillating). Recently visited the Netherlands where the guide at Muiderslot castle referred to the origin of a Dutch phrase "Houd je wafel (or waffel) dicht!" which is translated as "keep your waffle closed". The term apparently derived from children being allowed to cook waffles in a waffling iron over an open fire and being too busy chatting away amongst themselves that there was a risk that the waffles would end up being burnt. The adult would say "keep your waffle closed" as a way of telling them to stop chatting and concentrate on what they are doing. A quick look on google suggests the phrase was widespread in the Netherlands in the C17th so I wonder if the term waffling came into English from that source. Not an answer, just some clues, perhaps, to the use, "to be noncommittal or inconstant". Wiffle (whiffle) and waffle (whaffle, woffle) seem to involve swinging or swaying or moving back and forth (literal 'vacillation'); the word wiffle-waffle has among its meanings 'to speak in a meandering manner'. In the American use of 'waffling politicians', they either speak in an evasive manner so as not to be held to an opinion, or they flip-flop and say today the opposite of what they said last week. The Dialect of Craven in the West Riding of the County of York (1828). P.S. In his A Glossary of the Cleveland Dialect (London, 1868) the Reverend J.C. Atkinson defines waffle as "to waver or vacillate; to be undecided" and refers to Old Norse vöflur (doubt, uncertainty, hesitation). (more lagniappe) Here we have a description of whiffling-whaffling that shows it was a skill akin to modern American baton-twirling at high-school and university football games. Here in Fenland Notes and Queries (Cambridgeshire, 1900) we have an attestation of waffling as a kind of deceitfulness ("tricksy, waffling fellow"). There has been a great deal of "waffling", to use a slang expression. There has been a great deal of indecision and a great deal of uncertainty. No one knows just where he stands. N.B. These last two attestations go to your question about "divergence". Not the answer you're looking for? Browse other questions tagged etymology american-english british-english middle-english german or ask your own question. What is the origin of “woof!”? What are the origins of the regional pronoun “yinz” of southwestern Pennsylvania? What are the origins of gully and googly in cricket? What is the etymology of 'munge'? Where did the word Yankee originate? Is “giddy” derived from “Gid” which was Middle English for “God”?